I made a trip to the mall during lunch today looking for some thick heavy sweaters for my ski trip this weekend. I walked out with only one item but wanted to share a few quick fitting room pics. Banana Republic – Take an additional 50% off already reduced women’s items during “Happy Hours” (from 5-8 PM local time tonight). I looked through the sale section but didn't find anything interesting. Although, I did buy this belt yesterday. As expected, the XS fits me well. You can score this belt later today for $6.00 in stores. Forever 21 – 30% off sweaters and blazers – I didn't find any cute sweaters that worth buying but ended up getting this top. 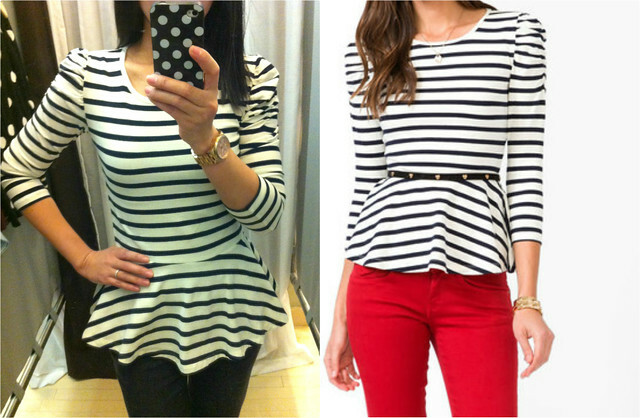 Stripes and peplum – what not to love, right? A size small fits me perfectly. The peplum sits right where it's supposed to on me - Bought! As for this sweater, I like it very well but it wasn't what I am looking for so I passed. The Limited – Take an additional 40% off sale styles. I only tried on the lace dress above. I am wearing a size 0 in this picture. The top part of the dress fits me well. However, the bottom part of the dress is a bit wide around the hip area. 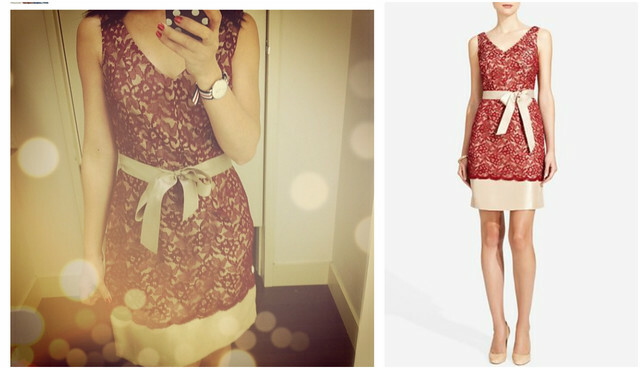 Also, the price for this ribbon-belted lace dress I tried on a few weeks ago drops again to $27 in stores. I passed on both because I don’t really need another lace item. I also found this MNG by Mango peplum skirt at JCP. I am wearing a size 2 in this picture. The waist fits me snugly (which is good) but the length was a bit long. The material feels very nice and soft. It's 100% lined. It's on clearance for $17. I can't find it online but wanted to mention just in case you want to look for it in stores. I wasn't 100% sure about this skirt so I passed. The red lace dress is really pretty. I love the lace details on it. 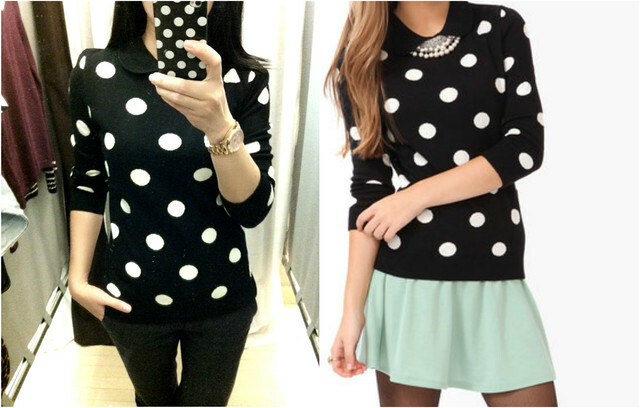 The polka dot sweater was cute too! Too bad neither worked for you. I wish I can shop during my lunch break. :( I'm jelly! lol! You passed up some adorable finds! So sad you passed on the lace sheath- it's darling on you! 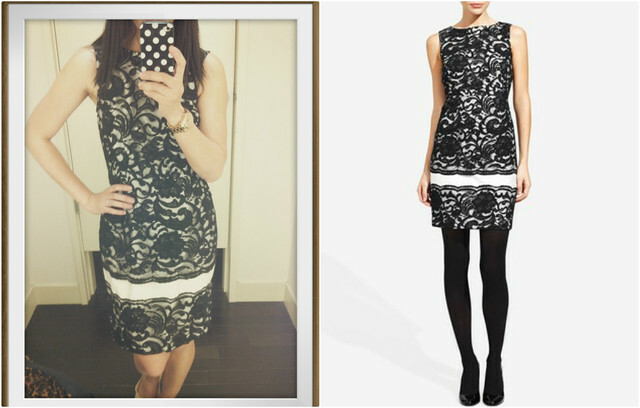 $27 is a great price for the lace dress. You always find such great deal. I don't think I would have been able to resist the deal. The peplum top looks great on you. I pretty much love everything you tried on, especially that red lace dress! What cute finds! Esp the MNG for JCP. Nice to see peplum still hanging around :).